Lar Lubovitch Dance Company. Dancers: Jonathan Alsberry, Jay Franke, Attila Csiki. Photo by Todd Rosenberg. World-class dance hits Chicago this week! Not that we don’t already have those bragging rights with our local plethora of top-notch dance companies, but this week the Chicago Dancing Festival brings together an eclectic group of artists from across the country and, for the first time in the festival’s history, an international presence represented by dancers from the Royal Ballet of London. The festival kicks off its fourth year with a benefit performance on Wednesday and continues with free shows at the Harris Theater for Music and Dance (Thurs), the Museum of Contemporary Art (Friday) and the Pritzker Pavillion at Millennium Park (Saturday). With only one Chicago-based company performing this year (The Joffrey Ballet), founders Lar Lubovitch and Jay Franke recruited their dream cast with a specific goal in mind — to cultivate a new audience. “There are people in the audience that are huge dance lovers and follow everything that happens in the city, but we’re programming more toward that new audience,” says Franke. “We want them to have the best that’s out there. We’ve utilized a lot of the Chicago companies in the past. We start every year fresh and try to compose the best program.” On the program this year is a giant range of styles. 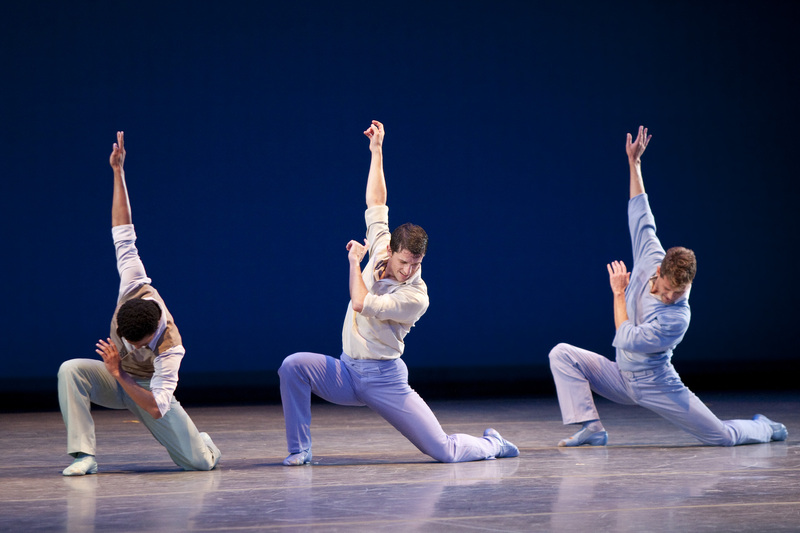 The Modern Masters program includes choreography by Christopher Wheeldon, Paul Taylor, Lar Lubovitch, Mark Morris and newly named Artistic Director of Alvin Ailey American Dance Theater (he takes over next July), Robert Battle, while the Celebration of Dance that closes the fest includes more classical works from Balanchine and Sir Kenneth MacMillan. RB talked with Founder/Artistic Director Jay Franke, a former dancer with Hubbard Street Dance Chicago, Twyla Tharp and Lar Lubovitch Dance Company and Julliard grad, about the history of the festival and what he’s looking forward to seeing this week. RB: Why did you start the festival? How did it come about? JF: Lar (Lubovitch) and my partner, David (Herro) and I were out to dinner one night and were talking about what we felt was missing with dance in Chicago. We really felt that Chicago was missing a large-scale dance festival. We obviously knew there were smaller festivals here that were more geared toward the local dance companies, but we felt that if we could create a larger platform for dance in the city, we could grow a new audience, which was really our first goal. There’s a new audience out there…or maybe the new audience is the Joffrey audience that is now going to see Hubbard Street or Melissa Thodos or Gus Giordano, so we’re kind of cross-pollinating the different company’s audiences. Early on, the idea was a festival. We felt in order to make it user-friendly, that it needed to be free. As Lar often says he wanted everyone invited to the party. If we’re going to create this festival and then charge $30 a ticket, it’s counterproductive. We set our sights on Millennium Park early on. I also felt that if we wanted to start this giant venture, we needed an artistic institution behind us. RB: Is that the Chicago Dancing Company? JF: We formed the Chicago Dancing Company first, then we searched and shopped for an artistic institution – and we weren’t necessarily looking for a dance institution – and came across Peter Taub and Greg Cameron at the MCA. We told them about this idea we had to start a festival and they were immediately interested in it because one of the missions of the MCA was to grow outside of the museum walls and they felt that by them contributing to us, they could get us a meeting with Millennium Park to pitch the idea, which we did. At that time, Helen Doria was running the programming. The hope was to do this in 2008 and this was maybe January 2007. Helen grabs the calendar and says, “We’ve been looking for a great dance opportunity – we’re doing it now!” She gave us a Wednesday night in the middle of August and it was up to Lar and myself to come up with the programming. The first year, we had our one night and we had over 8,000 people there. It was the most frightening experience of my career. It really was. It was my first time to be on that side of the curtain. It’s completely out of your control. The weather was a threat that year. We didn’t know how many people were going to be there. We’d done all that we could as far as our funds could take us with publicity. We had some great stories written in the papers, but didn’t really have the money to splash ads everywhere so, through some higher calling or higher being, it went off without a hitch. It was exciting and electrifying for me to just be there and be in that moment for the first time. RB: Are you dancing in this year’s festival? JF: No. I’m actually slowing down as a dancer. I find myself less and less interested in dance as a dancer. Things are starting to hurt now. I always say to myself that I never want to be in that place where I’m going on stage and all I can think about is getting through the pain to get to what I love doing. Let’s face it, dance is about being young and feeling good. Plus, the festival occupies the bulk of my time. It used to be just a couple of months in the summer, but now it’s more like a full-time job. New York City Ballet artists Sebastien Marcovici and Wendy Whelan. Photo by Todd Rosenberg. RB: What’s it like working with Lar? JF: He’s great. He’s a mentor to me. You get to know someone artistically in a studio, but until you start working side-by-side with them and see why they make the choices they make…obviously Lar has so many great contacts in the dance world and has such a great reputation. When the idea was first initiated, he was the one that called companies. Now, we have companies calling us because they want to be a part of it. It’s a very cool experience. I’ve been in class in New York next to dancers that have danced on our stage and they thank me and say it was the most incredible experience. Especially at the Pritzker, for them to dance for that amount of people on that architecturally beautiful stage…and the view from the stage is phenomenal. You can see the Modern Wing and all of Michigan Avenue. RB: You never think about what the dancers are seeing. What pieces are you most excited about this year? JF: I’m most excited about the largeness of the works we’re presenting. The Mark Morris Dance Group, Serenade (Ballet West) is with 26 dancers…these are large pieces. Every year we learn from what we’ve done. Not that we make mistakes, because we feel like every year presents a different challenge for us. I felt like last year we left thinking we did smaller pieces and that we should do larger-scale pieces. Also, this year we’re doing something a little different with our format. We’re presenting the same company twice. The Mark Morris Dance Group will perform Thursday and Saturday doing two different works. I think the idea of the larger-scale companies is what I’m most excited about…seeing those companies take the stage. The Paul Taylor piece that Julliard (School Dance Ensemble) is doing – I’ve watched them in rehearsal, they’re just the most dynamic group of individuals – it’s a great opportunity for them to be on the same stage with Wendy Whelan (of the New York City Ballet). It’s huge for them. There’s a lot of large opportunity for all of these companies this year and for the audience to experience the bigger companies. RB: You’ve had a pretty amazing career (Julliard, Twyla, Hubbard Street, Lar’s company)…did you start out taking ballet classes? JF: Tap. I wanted to be Fred Astaire. (Laughs.) Then I switched to Gene Kelly and back to Fred Astaire. I couldn’t make up my mind. My Mom and Dad were so supportive from the beginning. “You want to be a dancer? Sure!” My 90-year-old grandmother still thinks I’m a tap dancer. When I dance for Twyla or whoever and she comes to see me she says, “That was the best tap dance I’ve ever seen!” Yes, it was Nana. Tickets to the MCA and Harris Theater shows sold out quickly, but you can still venture down to Millennium Park for Saturday’s Celebration of Dance. The performance starts at 7:30 and is guaranteed to be some of the best dancing — non-tap — you’ve ever seen.